I suppose car names are a lot like hash names and have to be earned. For the record: I parked this way only to take the photo. While I admit that I will be parking away from other cars for awhile to diminish the chance of door dings I’m not one of those new-car douchebags who takes up more than one space. I loved the Jackmobile. Had Honda treated me as a customer they wanted to keep when its transmission crapped out in 2010 I would have been a Honda man for life. But they didn’t. Yesterday I took possession of a new 2015 Mazda 6. It’s a four-door sedan, something I never expected to own again (the last four-door car I owned was nineteen years ago), containing all of the amenities that I think I want — tan “leatherette” seats, automatic climate control and a bluetooth stereo system. 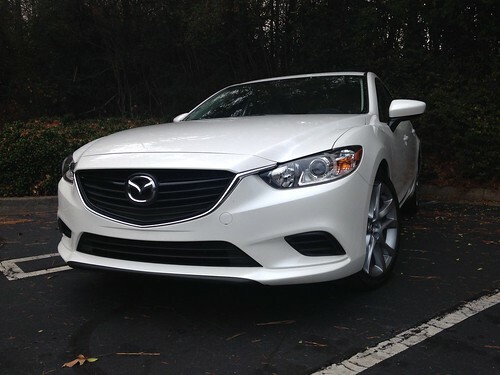 In true Paulie fashion I went the frugal route, getting the middle-of-the-road Mazda 6 and not the top-of-the-line model, though I did add a few extra features like LoJack. I’m trying to figure out how I am going to transport a bicycle because I’m not keen on jumping back into full-time roof rack world; time will have to tell on this one because I’m also not a fan of temporary trunk racks. Funny how I now remember having this same dilemma when I toted my mountain bike up to Fort Yargo to do an adventure race with the then-childless Raleigh Royalty way back in 2002/2003. Use TrueCar (I went there via American Express). This site might help you walk into a dealership knowing exactly how much you will pay for a car, including their charges. Eat a big breakfast or pack a lunch. I was at the dealership when they opened at 9am and I did not leave until 1:45pm; to be fair some of that time was spent waiting for them to install the LoJack. I didn’t realize that I would be there so long, so my breakfast consisted of three meager turkey sausages that I ate at the house. This morning in the shower I realized that I did one thing I regretted, I forgot to pop out whatever CDs were in the CD player. While of no monetary value, there was one mix-CD given to me by an incredibly dear friend that I will miss. Oh well, such is life. The shower is such an amazing place of clarity. Since I am taking the day off from work tomorrow I need to make one final push to get features in my CES app done today. Tomorrow expect a short 2014 year recap and some insight as to what I plan to do next year. Hey, just a shout out to see if y’all (Paulie’s followers) would be interested in a Gwinnett Gladiator’s outing. We can do the same thing we did a couple of years ago. I can try to get special prices for a group package (tee hee). Of course tailgating is mandatory! The best date, in my opinion, is Sunday, January 11 at 2:05. Let me know, followers. Though I don’t follow myself, that’d be creepy, please count me in for a Glads outing! Very sharp, it’s going to take some getting use to seeing you in any other color than red. Call the dealership, the car is probably still there. I left a pair of sunglasses in the old Escape, they held them for me. If you can, get a hitch mount, I love it. I never had a roof rack (too short) but I can’t imagine going back to the ‘trunk’ rack again. Again, congrats, I expect you will have many fun years together! Nice ride! When we bought Laura’s car we used a car pimp (car finding service from her credit union, but car pimp sounds better) and it was awesome. We told them what we wanted and they found the car and negotiated the price for us. We showed up, signed some papers and were out in about 20 minutes. That was nice. Now for your bikes, I would recommend installing a hitch and getting a hitch mount rack. The hitch is hidden pretty well and it is easy to install and remove the rack when you are not using it. Only 4 bolts, you can install it yourself in 15 minutes. Or drive up here and I can install it in 15 minutes. Ausgezeichnet! Ihr neues Auto ist sehr schön. Do the seats not lay down? I think I could get 2 road bikes in my hatch if push came to shove. The hitch idea seems like the best bet if you don’t go up top, however, getting rear-ended with bikes on the back isn’t fun (been there, got a new bike). Laura/Bob… any deets on the housewarming?? Huh, I didn’t think a hitch was available for this car. I wonder how low it hangs (heh heh), I’d hate to drag it along when driving on those crappy campsite service roads. Seriously considering this route. Steve, the rear seats fold down, but I honestly haven’t investigated how far yet. Martha, because I wanted specifically-priced cars my options on the lot were blue or white. The crazy thing was that I didn’t haggle all day! I spent time waiting for them to prep the two cars I wanted to test drive (both had the plastic still on them), spent time waiting for my credit check and all, spent time waiting for the finance guy to get things moving, and then spent time waiting for the LoJack to get installed. Very nice, look forward to seeing it in person. Almost any car can take a rear hitch, NEVER get it from the dealer anyway. We wanted a 2″ hitch (since that’s what the truck has), and of course the car isn’t rated for that, because of towing capacity. Allan could help install it for you as well. Of course you’d have to buy another rack, but you aren’t poor, just put off buying some electronic something for a few weeks. I’m not poor because I am CHEAP and I’ve not been able to convince a woman that I am date-worthy in a decade. Even if I’d stick with the roof rack I’d have to buy new mounts because the shape of the roof is different. I *think* I’d also have to do a fixed install where you take out the little strips from the roof and screw the rack into the holes under them. You would almost certainly need new clips- and Yakima clips aren’t cheap (as I think they should be). I never put the rack on my car as I supposedly need new bars as well. I have to check with my social secretary, but I think the 11th might work. We can call it brunch, Barb. Laura- I also need to check with Mark & June about tickets, they were just asking me about going to a game. We can always fry up bacon……… we do have the camping grill. Bacon and hockey, eh? I’ll bring the Molson. Bacon, Hockey, and Beer? Throw a bike ride in there and it would be a perfect day! Going to be fun! Not sure if anybody has to work on Friday so we will set the housewarming party for 4. Early enough to feed the kids and late enough to get some work done if necessary. I have to work friday, probably all day until 5.
but – we will be there later.